So, what's happening here? Well, as explained on TeleMonster's website, it's a series of children's cartoon shorts featuring forest monsters Eerie (a wolf), Yossi (three-tailed fox), frog sidekick/snack Rock-G, and the spherical Popo, who can "teleport viewers to their friends in the television world". These main characters are accompanied by Madame Coco and Monsieur Cou, their eggs Oma, Omi and Ome, as well as pond-monster Mikli and shark Jawjaw. All are featured in a series of shorts which have resurfaced in furry circles in recent months as the show started to air. The show's first preview came out in October 2014, followed by a monk-filled extravaganza, a sheep-shearing interlude, and a trip to candyland. They were produced for public broadcaster MBC by Studio Gale, who specialize in children's programs with animal characters. Naturally, furries have been providing their own renditions of the show's canid duo, many of which are actually suitable for its target audience. There are also official mascot costumes, and an original sound track by local boy-bands Infinite and BtoB (responsible for Eerie's 'Come On'). Well, it sure ain't Gangnam-style. So many thriller references, it's scary. Well, Micheal Jackson was apparently very big in South Korea. Furry imageboards are in love with this new thing. Because it has a cute girl with big hips. Do these people know about Disney's forthcoming "Vampirina"? Or does Disney know about "TeleMonster"? Of course they do! 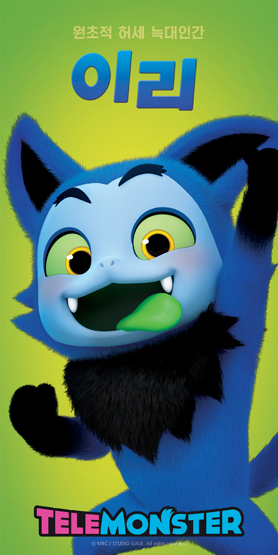 Vampirina is a little vampire girl who comes from Transylvania. Hey, since Transylvania is a real place (the Hollywood composer Miklos Rosza was from Transylvania), does anyone know how the people in Transylvania feel about their vampire stereotype, here and in the "Hotel Transylvania" movies? There were reports that a tourist-trap haunted castle was being built on or near where the real Dracula's castle was; but since the real Dracula's castle was in Wallachia, not Transylvania ... I'm confused. Oops; forgot to include the weblink. Sorry. Well, I think since we're preserving everything we create for many decades, the illusion of "new" things is slowly getting peeled away. Nothing is really new, and creative people get the same ideas every few generations. What I am trying to say is: people invent similar stuff at the same time, all the time, without ripping anyone off. Matters may be better offline; but digital media decays, too… and what's cutting-edge today is obsolete tomorrow. And yet we still remember Casablanca and Sherlock Holmes. Just last weekend I started watching The Adventures of Sherlock Holmes, a 1984 TV adaptation of the books. It's really cool. Anyway I found this through work that is not suitable for the target audience. Specifically that done by Kuroodo.